Just outside the entrance to the park is the park sign. Great photo op! Photo taken by random tourists whose photo we then took in return. Thanks, random tourists! If you only have time for a few hours at Hawaii Volcanoes National Park, doing the Crater Rim Drive is definitely a good choice. (Note: not all of the Crater Rim Drive is currently open due to volcanic activity – check with the visitor center when you arrive to see what’s happening when you’re there.) Stop at the main visitor center to get a good overview of the park and a chance to at least read about the places you won’t have time for. The rangers there are very knowledgeable about what’s happening where and are more than happy to chat with you and answer any questions you might have. They can go over the map with you, too, pointing out highlights and must-see stops. Almost across the street from the main visitor’s center is the Volcano House hotel. It is currently under renovation (six or so rooms open now with full opening scheduled for June 1, 2013), but the viewing deck is open and they have a beautiful vantage point overlooking the whole crater. They also sell snack foods in the gift shop if you need a little something. There is not much else available food-wise in the upper part of the park. There is a little snack shack down at the end of Chain of Craters Road if you head that way. “Steam Vents” is the first main stopping point and there is a crater overlook on the left side of the road along with a fenced off steam vent. You can safely get close enough to this steam vent to actually feel the steam and the warmth. We stopped by there at night when it was cold outside, and our nephew was very excited to warm up next to it … until he realized that all that steam was water, and now it was soaking through his pants! We all had a good laugh over that. Across the street is a boardwalk trail that goes through some grassy areas and into beautiful rock formations. 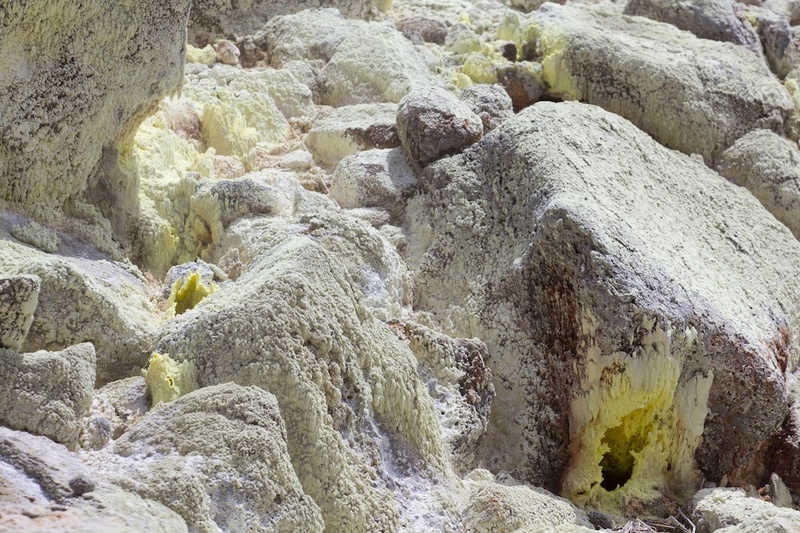 The minerals from the steam have left interesting formations and some amazing colors. Rock formations near steam vents. Check out that wild color! 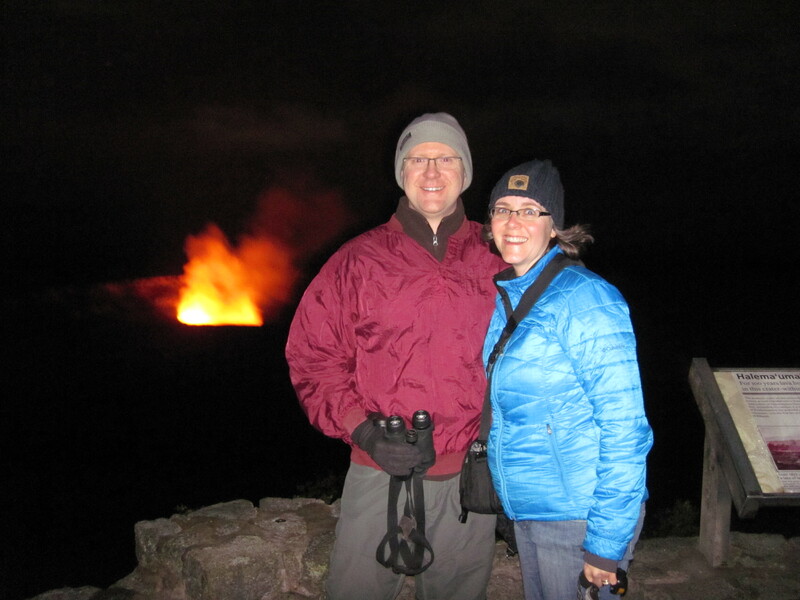 The Jaggar Museum is the best crater overlook spot, and it is THE place to be at night. 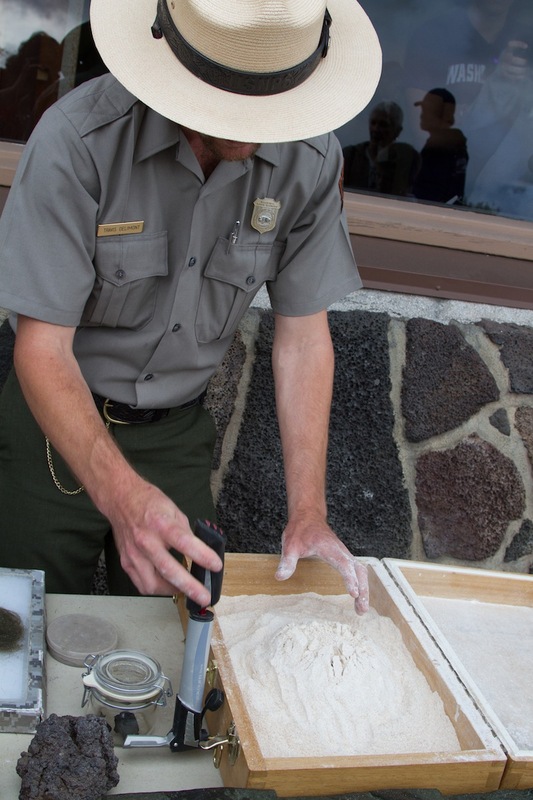 But, things can change quickly here, so ask at the visitor center before making your plans. Dr. Thomas Jaggar from M.I.T. 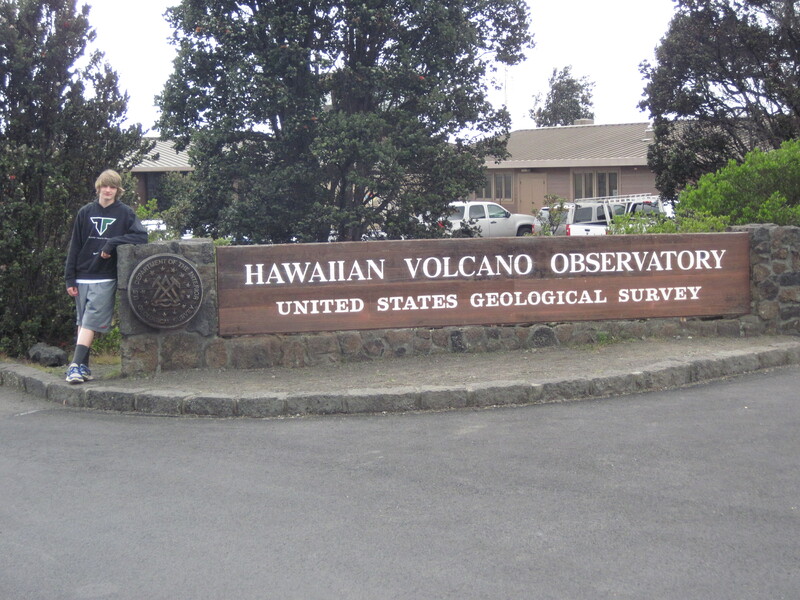 created the volcano observatory way back in 1912, but it was moved to its current location a little later, when this area became a national park in 1916. 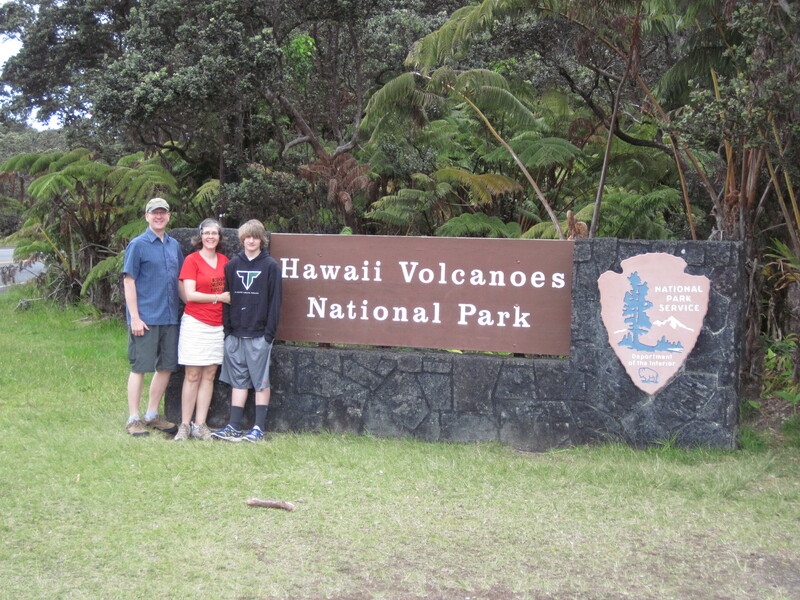 He’s the main guy who came up with new ways of studying the Hawaiian volcanoes. There are rangers working here, too, and they can answer any questions you have, such as what kind of bird is flying around in the crater (a white-tailed tropic bird!). They also do demonstrations, such as how the volcano formed (using flour, a pump, and a balloon — who knew?!?) and can show you what “Pele’s hair” looks like. 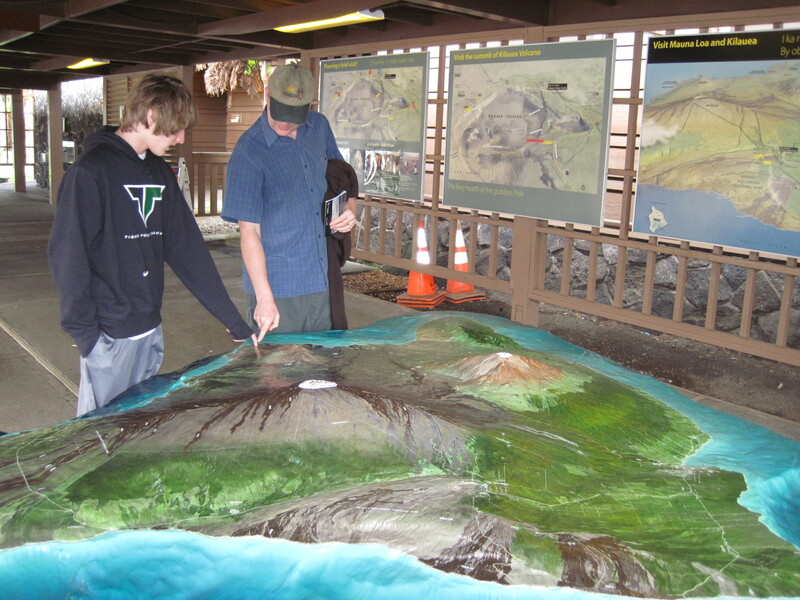 Inside the museum are exhibits about Pele, seismography, and volcano history. And of course kids of all ages love to jump on the floor next to the seismograph to make their own earthquake! There were seismograph printouts on display, and it was interesting to see that there had been several mild earthquakes in the park in the past few days. Unfortunately (or luckily?) we never felt them. There was also a digital seismograph there, which we hadn’t seen before. 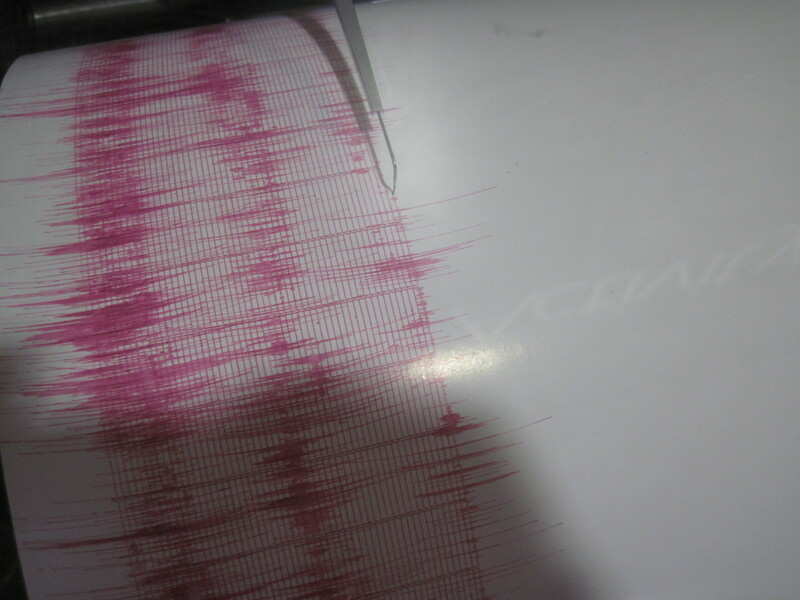 Seismograph – check out that long pink line we made by jumping! Currently there is a lava lake down in the crater. 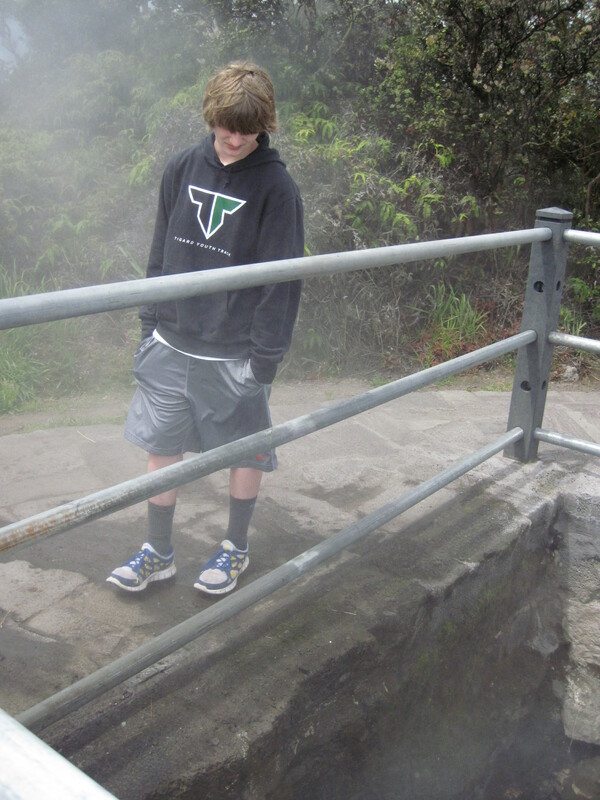 The lake can’t be seen from the rim, just the smoke and gases pouring off it and out of the volcano. 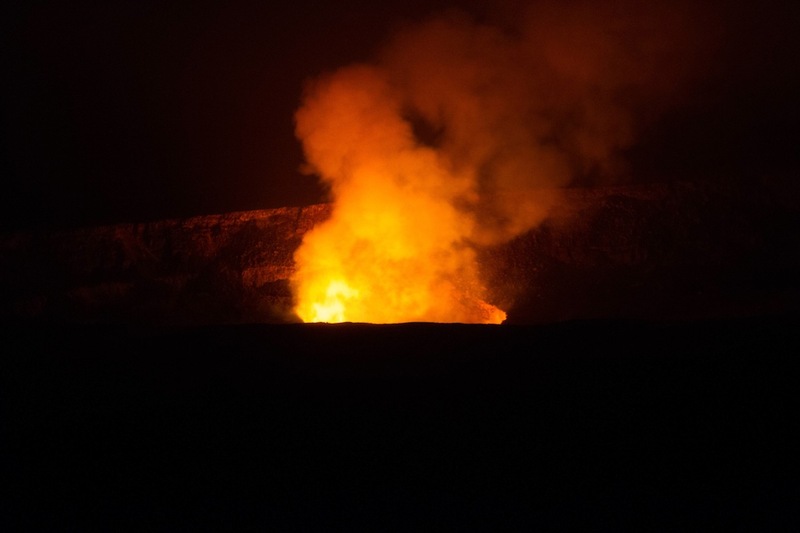 At night, however, the lava lake lights up a giant plume of gases and steam and it glows bright orange. As the wind rises and falls, the steam plume dodges left and right and gets larger and smaller. It’s mesmerizing and magical! Reflection of lava lake in Kilauea caldera. Canon 7D camera set on ISO 6400. Although you can certainly see it with the naked eye, we enjoyed looking at the steam plume through our binoculars. We could really watch it dance and see the shadows change. Photos of the steam plume were a challenge even with my Canon 7D set on 6400 ISO because I didn’t have a tripod. I was able to set the camera on a rock, but it wasn’t as stable as I would have liked. We had really good luck getting photos of people AND the volcano using the night setting on our point and shoot Canon D10 camera (see photo below). That setting causes the flash to go off but the shutter also stays open longer – long enough to catch the glowing plume. As you can see, we were dressed for cold temperatures because that wind is chilly up there at night! It is 100% worth it, though, and we’re so lucky to have had a chance to see it. Have you ever seen an active volcano? Tell us about it in the comments, and enjoy your week or your weekend!